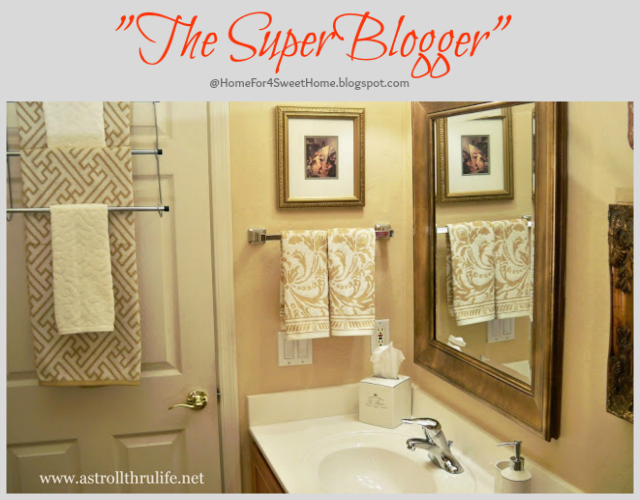 The spotlight is on to Marty of A Stroll Thru Life's Hall Bathroom Makeover for under $100! You know how much I love budget-friendly projects and what a way to start this spotlight to a budget-friendly bathroom makeover. One of my favorites of this project is the faucet, what a beauty. I really love her diy tray on top of the toilet tank which she also provide a tutorial on her blog. That tray actually solves the problem on how to make use of that space without sliding anything you put on top of that tank. Totally genius! Don't you love an extra storage? Marty placed an over the door curtain rod which allows more space to hold more towels when guests are around. 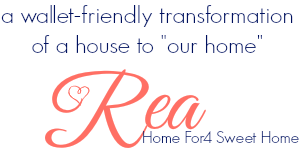 You should check out how Marty pull this project off all by staying within her budget by stopping by to her blog and you may want to mention that she is The SuperBlogger. From a jungle theme, builder basic, to elegant and chic. Tons of DIY projects and Thrifty finds. If you want, you can grab my The SuperBlogger button below for your sidebar. Pssst: Do you want to be on a spotlight and be The SuperBlogger? Read the details here or just click on the tab above this page and fill out the information. Oh my goodness, what a surprise and honor. Thank you so much for the spotlight.